It is so thrilling to have a visual arts exhibition accompanying our Joffrey Ballet performances this weekend. Installed at one end of the Dorothy Chandler Pavilion’s glittering mezzanine level, the display feels like an historical moment for L.A dance. Modest in appearance but profound in impact, the exhibit gathers photographs of innovative dance that poured forth concurrent to the film industry’s great creative burst of the 1920s and ’30s. It gives form to an idea that’s been gathering steam: that Los Angeles wasn’t just a haphazard, faraway outpost of American dance in the twentieth century, but the city was a key incubator in the art form’s development. The show garners all necessary chutzpah and splendidly tosses a rich cast of players against a wall. Much will stick in my opinion. The main event of the weekend is the Joffrey Ballet’s historic reconstruction of the infamous lost production of the Ballet Russes’s “The Rite of Spring” choreographed in 1913 by Vaslav Nijinsky and almost immediately gone missing. The exhibition, Stravinsky and L.A. Dance, takes the ballet’s composer as its reference point, positing that Igor Stravinsky’s creative influence on dance-makers in Los Angeles was significant. I particularly appreciate the righteous emphasis placed on the strong female contingent, represented by the three figures shown here: Norma Gould (above), an early modern-dance pioneer and peer to Ruth St. Denis and Ted Shawn; Nana Gollner (right), student of Theodore Kosloff, a solidly trained technical ballerina who was the first American ballerina to garner a credible following in Europe; and the formidable Bella Lewitsky (below), protegee and muse of Lester Horton whom Horton cast as “The Chosen One” in his own modern-dance version of “The Rite of Spring” at the Hollywood Bowl in 1937. Gollner’s legs of steel were the byproduct of her Russian teacher attaching weights during training. Kosloff, among others, is featured in the show, viz., Adolph Bolm, Ernest Belcher, Michio Ito, Kosloff, Serge Oukrainsky, Andreas Pavley, George Balanchine and Horton. Curated by Lorin Johnson, a Cal State Long Beach dance professor, and Mark Konecny, associate director of USC’s Institute of Modern Russian Culture, the exhibition explores early dance innovation in Los Angeles (1910s-1930s) as a synthesis of ideas from émigrés and local artists. Influences from Ballets Russes dancers and early LA modern dance pioneers are examined within the melting pot of the city’s rich dance community, exemplified by programs presented at the Hollywood Bowl and Philharmonic Auditorium in the 1930s. The organizers have done a super job of weaving the disparate roots of classical ballet and modern dance. This overheated rivalry is rendered innocuous by side-by-side treatment in the exhibit. Heck, in real life, one building — Trinity Auditorium (god bless it, it still stands on lower Grand Avenue) — housed Kosloff’s ballet studio in its basement (Agnes De Mille cranked her first plies at his barre) while upstairs Ruth St. Denis and Ted Shawn taught Charles Weidman in an atelier. Weidman regularly snuck into Kosloff’s class unbeknownst to the barefoot duo. Running through this complex narrative was the influence of Stravinsky, in a real way because his 30 years of residence in L.A. spawned myriad artist salons, dialogue, discussions, and projects; and on a symbolic level the exhibit suggests that Stravinsky’s clarion blast of modern music at the Chatelet Theater in 1913 reached all the way to California. Here Europe’s emigres settled and here, drenched in sun, they grappled with modernism. The exhibit asserts that the atmosphere in Los Angeles, so far from Europe, was loose and unconstrained with strong doses of bohemianism and nature-communing. The dots are, again, disparate, but the exhibit goes far to connect them. One of my favorite images shows a line-up of ballet girls taught by the great English-born master instructor Ernest Belcher, a player in early Hollywood and the dad of Marge Champion. The girls appear unshackled by ballet buns; indeed they are coiffed loosely, flapper-style. They are bobbed ballerinas. Yes, there would be ballet in Los Angeles. But it would be our way. olderDoug Varone & Dancers flash fun, finesse in O.C. 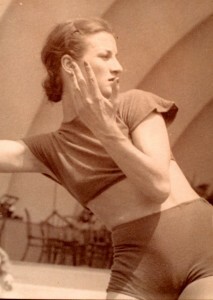 Mary Louise Pollock BLANCHARD was one of the Norma Gould Dancers at the Hollywood Bowl in 1929. She was my Mother. She was passionate about her love of the arts. Besides the beauty of her Dance, She was the first woman teacher in Los Angeles County,she was an accomplished pianist, and had had the voice of a song bird. I studied with Maria Bekefi on McCadden Place in the late 60’s – wish I could find any information on her. Later I studied with David Winters who steered me to Bobby Banas at the old Perry Studios on Highland, also with Andre Tayir (two Jets and a Shark). My cousin had studied with Madame Nijinska, her mother having moved the family from east Texas to find good teachers. How lucky to have had those wonderful teachers. In the 1950’s .. I studied with Nico Charisse, Michael Panaev, Eugene Loring and then George Zorich in the late 1960’s. Took jazz lessons from Jack Cole who was a phenomenon. The other students at Loring’s school were George Chakiris, Perry Lopez and even Jane Fonda came in for a few classes. Eugene Loring later became Artist-in-Residence at the University of California, Irvine. My favorite teacher at Loring’s was Aaron Gerard … Sally Whalen was also there as was Eleonora Mara … a tough taskmaster, but that was what I needed. Loring would teach our classes occasionally and Mr. Sig would be at the desk taking care of business. Those were wonderful times and I’m glad I had those experiences. Those who liked this piece might also like my “Bertha Wardell Dances in Silence: Kings Road, Olive Hill and Carmel” at: http://socalarchhistory.blogspot.com/2012/06/bertha-wardell-dances-in-silence.html. My grandmother is one of the Ernest Belcher dancers in the last photo! Mary Fanjoy is the 4th dancer from the left with the dark bobbed hair. She was a dance double for silent film star Colleen Moore so her hair was styled to match Colleen. I have many more photos of my beloved grandmother “Mimi” in her dancing days! It’s great to know that Los Angeles has such a rich and varied dance history. Fascinating! As a native Los Angelean I “was allowed” to begin dance lessons here at the age of 8 with Michael Brigante. He was a maestro in the classical tradition. Then in early adolescence a chance to experience “dance improvisation” with Mary Whitehouse and in high school, study at the Eugene Loring American School of Dance where many N.Y. transplants taught, plus a Connecticut College Graham-trained teacher at University High/LAUSD in WLA. Along with all of these “greats” were Margaret Dietz (German Dance Theatre), a “guest artist” at UCSB, and leading modern choreographers and their companies as guest artists/instructors at UCLA Dance Department, beginning in the early 1960s. Prior to my own leave-taking to further studies and professional modern dancing in NYC, I also had the incredible challenges and rewards of studying with Carmelita Maracci at Perry Studios on Highland Avenue in Hollywood. The richness of those classes in music, dance, history, interpretation and gesture, mind-boggling technique and an intense passion had a lasting impact. Performing with the Pearl Lang Dance Company, with Katherine Litz and Merle Marsicano and groups, and an understudy with Merce Cunningham and Company in N.Y. seemed only a natural outgrowth of my Los Angeles upbringing. There were strong “pure” and genuinely innovative dance masters if you choose to follow them. Wonderful article – yes, my generation (1950s) all studied and/or danced with Lester and Bella and Carmelita and all the rest who were teaching and performing throughout the 20th century. L.A. has always been looked down on by N.Y., but it was/is a valuable place nevertheless. I think the main difference was a result of hastily producing “show” dancers, for vaudeville, touring, cruise ships, movies, clubs, and Las Vegas. Classicism rarely took hold in the purist sense of the word, but dance as entertainment for the masses certainly did. One must always remember that L.A. is a company town — movies, then and now, influence almost everything. Wish I could see the whole thing! Thanks for sharing this with us non-L.A. peeps too. Looks amazing.